The Super Falcons at training in Murcia, Spain on Sunday morning. 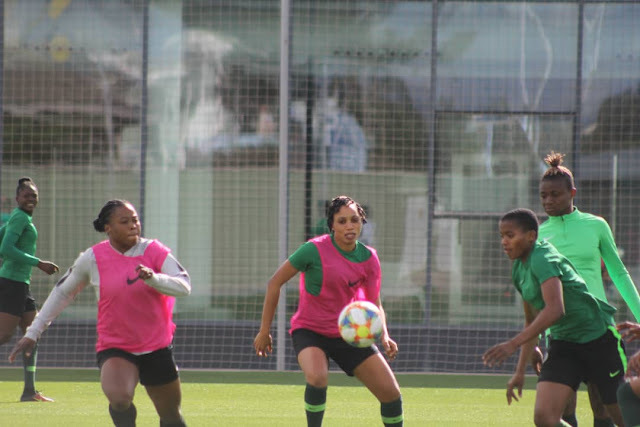 After pounding a first division club from Iceland (UMF Selfoss) 6-1 on Friday, Nigeria’s Super Falcons face a more worthwhile test when they square up to their Canadian counterparts in a friendly match in the city of Murcia, Spain on Monday. Following earlier tests against teams like China and Belgium in the run-up to the 8th FIFA Women’s World Cup finals in France this summer, the nine-time African champions will be able to truly measure their progress against the Canadians, who have promised to field their full strength on the day.